Much has been written about leadership and there are many definitions of leaders and leadership. From the management perspective, leadership can be seen as a desired individual trait and behaviour that is sought after in firms, institutions, corporations and community. Everyone from the chief executive to the tea lady is regarded as a “manager” as we all have to manage time, activities and resources. In the role of managing, we look for the characteristic and behaviour of leadership to achieve superior performance. Whilst it is important to recognise and encourage leadership, over the last decade there has been too much emphasis and focus on leadership, in particular “heroic” leadership, while “servant” leaders are often forgotten. enlist their fellow managers to work with them to pursue a common mission toward a shared vision. These leaders become successful and outstanding because of the support of their team of competent managers. When asked of these leaders, they would acknowledge that they rely and stand on the shoulders of the great managers that they have. No great leader can achieve a superior outcome on his or her own. Leaders and managers are not necessarily separate personalities or entities as some writers might assert. Great leaders are also excellent managers and vice versa. Leadership roles are more often bestowed upon those who have been excellent managers during their career journey. Hence, leadership and managership have a symbiotic relationship like Yin and Yang. When called to lead, the leader’s management role will be delegated and undertaken by others in the team. It often depends on the situation. A fellow worker could be a good situational leader if he or she has the skill, knowledge or capability to resolve a problem when his or her superior is unable to lead in a particular point in time or in an extenuating situation. If a group of people were lost in the jungle and the chief executive does not have the navigating skills to get out of the jungle, an ordinary worker who has the ability to get the group out of the jungle would be called to lead in this situation. Sir Winston Churchill was a great leader in times of war. However, in time of peace he was not as effective as some other British leaders. In the annals of history, we have seen many instances where heroes and leaders became great because of situations where their talents and capabilities make them effective leaders. The recognition that leadership and management are mutually inclusive and symbiotic. Managership is dynamic and permeable, and should be cultivated and institutionalised as a pervasive behaviour throughout all levels of the organisation, not necessarily expected and manifested only in senior management. Managership can be developed, taught and learned through programme (content), action (process) learning and coaching. Managership is based on the personal mastery and development qualities of Values, Attitude, Knowledge, Skills and Capability (Leadership, Communication and Ability). Managership is the proper use of referent (influence), authoritative (compliance) and expert (technical) powers to develop and get the best in people. Competent managership is the entitlement of every employee as managers are remunerated and empowered to be responsible for leading and making changes for improvement. Excellent managership is the requisite, performing credential and characteristic for building local and global leaders. Managership for all organisations is the new management paradigm for the 21st century to meet the new knowledge-based economy’s challenges, recognising regional and global impact and opportunities. Management is traditionally defined as the function and general practice of planning, organising, leading and controlling. On the other hand, management leadership or managership describes the personal mastery of the art, science and practice of these management functions. It encompasses the relevant competencies to perform the management functions accompanied by leadership traits and behaviour. Like the definition of leadership, it describes the professional mindset and practice of strategic visioning, achievement of effectiveness, efficiency and excellence in how managers go about in performing their daily management functions and accountabilities to achieve distinctive and outstanding results. Malaysia has come a long way, from the labour driven days of its agriculture era in the 1960s and 1970s, to its investment-driven industrial era in the 1980s, followed by the productivity-driven technology era in the 1990s, leading to the knowledge era of the 2000s today. Different economic eras require different managerial leadership competencies. In this respect, Malaysian managers have been trained and developed to meet these competencies requirements of the transforming economic eras. As we now undergo transition into the knowledge based economy, we see the emergence and need to have a pool of highly skilled knowledge workers especially in the high technology, ICT and knowledge related industries engaged in enterprises such as software engineering, Internet Internet based, telecommunication, nanotechnology and biotechnology. These knowledge workers are very mobile and lifestyle-orientated. They are a new breed of talent workers that need to be developed as competent managers of future and emerging industries. Surrounding and contributing to this fast changing phenomenon are evidence of global turbulence manifested through foreign commercial colonisation and investment and the modernisation of China through their leapfrogging and competitive strategies arising from their low costs advantage. We also see the convergence of technologies including disruptive technologies, which lead to creative destruction, innovation and disintermediation resulting in new entrepreneurial ventures such as the likes of software giants Microsoft Corporation, Oracle and Sun Microsystems as well as the successful world wide web players like Amazon.com, Google.com, e-Bay, Skype and many others. In addition to globalisation, Internet connectivity, rapid communication and borderless trade phenomena, the leveraging of knowledge through knowledge sharing, access, management and self-directed e- earning offer further evidence of the speed and scale of global connectivity and accelerated learning of people that is taking place everywhere. The world is now a global village. Global turbulence, disruptions and innovations will present threats and opportunities. It will be threats and downfall for those who are complacent and basking in their past successes, and opportunities for the new players in the new era of constant business quicksands and paradigm shifts. The rule of the new game is that when a business paradigm shifts like the advent of Internet or the arrival of a new disruptive technology, everyone goes back to zero or the starting line as past successes do not guarantee future successes. Hence, the future business environment will be challenging for the uninitiated and will demand greater managerial learning, competencies and leadership in managers of today and tomorrow - if their enterprises and organisations are to be resilient, relevant and rewarding. Traditionally, the frontiers of management have focused on supervisory or frontline management; general management; strategic management; operations management; marketing and sales management; financial management; and human capital management. But now, the new frontiers of management have come to include risk management, knowledge management, supply chain management, customer relationship management, project management, supplier relationship management, activity-based management, balance scorecard management, stakeholder management, enterprise resource planning, business continuity management, succession planning management, cross border management, innovation management and total quality management. The manager of today and the future will be a different breed of people needing to practise excellence in managership if we are to be a nation of great managers in order to ensure our industries are highly productive, competitive and resilient. The Malaysian Institute of Management’s national charter and challenges will require MIM to be innovative and forward looking to prepare Malaysian workers and the present and future generation of managers to be able to competently handle and manage these new dynamic challenges - if we are to navigate our way to compete successfully and to achieve our Malaysia 2020 vision of becoming a developed nation. The answer is simple. We don’t dislike complaints, but we dislike the way they are given and in some cases the consequences they have towards our job and careers. It would be great if angry customers actually smile and speak patiently instead of screaming or shouting at us in public. It would be extremely wonderful if egoistic customers complain in a humble manner with total respect for us as fellow human beings. BUT this is not the case. In many of my programmes, I ask participants to write at least 10 words that come to their mind when I say the word complaint. The majority come up with more negative than positive words. This is so due to their prior experience with difficult customers. So what do we do? How do we ENJOY complaints and treat them as priceless business development opportunities instead of dreadful work hazards? The first thing I tell all my participants is, “understand why people complain.” A complaint is neither positive nor negative in nature. It is actually neutral. A complaint is simply a statement of dissatisfaction which stems from a difference in the service experienced compared to the service expected. In other words, not meeting your customer’s expectations. Now, do all customers complain? NO, not all but a mere five percent (5%). That’s right. Ninety five percentage (95%) of customers do not complain and they do not come back. Those who complain do so because they want to continue using your service or product and hence want you to improve your standards. Unfortunately, we look upon these 5% with dismay and discontent. Since we know that dissatisfaction stems from a gap between experience and expectation, and those who complain actually want to remain loyal to our company, the simplest way to rectify the situation is to fi ll in the gap as quickly as possible. There are 5 simple steps in handling a complaint. To listen actively you need to maintain eye contact, show acknowledgement with head nods, or use verbal acknowledgement cues such as “Yes, alright, I understand, OK and so on. You should lean slightly forward in an interested body posture. Stay focused on the customer and not get distracted by the surrounding environment. It is essential that you apply mental questioning skills when listening to the customer so as to prevent your mind from wandering and assuming. To understand a complaint, you must first gather as much information as possible via effective questioning skills. Open-ended questions are your best tools. Use the five W and one H (5W1H) method to gather information. 5W1H Method: What? When? Which? Why? Who? How? Q Let me see if I have everything in order Ms. Lui. You said that the bill you received this month is identical to that of last month. Is that correct? Q You also said that the watch purchased last month appeared twice on this month’s bill statement, right? Customer: Mak Cik tak boleh nak receive call lah. Customer Service Assistant (CSA): Mak cik dah bayar bill ke? Customer: Dah kut, tak tahulah, anak mak cik bayar biasanya. CSA: Biar saya semak dulu ya mak cik. Akaun telefon ini di atas nama mak cik ke? The CSA went into the verification mode and continued to ask questions. CSA: Nampaknya, bil dah bayar mak cik. Masalah ni biasa berlaku ke? Customer: Tak jugak. Biasanya mak cik boleh call dan receive call. Tapi tadi bila mak cik nak call tak ada bunyi pun? Butang dia pun tak de bunyi bila mak cik tekan. CSA: Telefon mak cik pernah jatuh ke ataupun terkena air ke? CSA: Mak cik cuba tutup phone tu dan on semula. Tengok OK tak lepas tu. Customer: Macam mana nak tutup? Mana butangnya? CSA: Senang sahaja mak cik. Butang yang mak cik tekan untuk on phone tulah. Customer: Butang untuk on? Oh kena on phone dulu ya? If it wasn’t for the CSA’s patience in probing, the problem would have never been solved. I totally agree with you. However, the chances of the customer disagreeing after he has consciously agreed is very low. All you need to do is remind him. Keep in mind that if someone wants to be diffi cult he will no matter what you do. However, not everyone is like that. People appreciate clear explanations and people who take the time to make them understand situations well. After they weigh all your solutions, which take into account, their time, effort, money and convenience, they rarely fall back on their word. Step 5 Solve Problem with Immediate Visible Action. Action does not necessarily mean the final solution. A frontliner will tell you that he only has a certain amount of authority and may not be able to make crucial decisions. So what does a person do when the crucial decision is not in their hands? My answer to that will be, do everything else. Pick up the phone, set an appointment, write a memo, fi ll in a complaint form, anything and everything in front of the customer. Customers want you to take them seriously, as you would want the same thing as a customer. Customers want to feel that their problem is YOUR problem and not one of the many problems you have to deal with. The best way to send that message is to act immediately. Don’t put it off or ignore the problem. Organisations are talking about gaining customer confidence. One way of gaining customer confidence in every day business is simply by assuring the customer of what you have promised them. Customer: But you promised me that it will be sent on Friday. You: I am sorry but I did not promise you. I said I will try my best to get it to you by Friday. Customer: Ya lah, so isn’t that a promise? You assured me that you would call your man and settle it. You: Yes I know that I said I will call the supervisor in charge, but I can’t promise you his part of the job. Customer: Then why did you so convincingly say that you will get it to me on Friday. You: I did not use the word promise. I said I will try my best. Aha. Does the customer register each word you say? NO! The customer remembers the emotion you gave him. “Trying my best, doing my best” is as good as “It’s done,” if you achieved emotional contact. Customers expect it because you have created an expectation. If there was no emotional contact, the customer is not assured at all and is not satisfied. In other words, not promising is just like promising. Yes and no. Yes because you create an expectation. No because, a promise is a greater commitment. I think I know the next question in your mind. “isn’t a promise a form of assurance?” Yes it is. So why do we have to assure them after a promise? How many times have you received empty promises? How many times has the sales person told you that there are no strings attached or you will receive the package within 3 days or your money back, or delivery is free and to your door step and later found out that those were all lies or half lies. Promises today mean very little unless backed by action. Assurance comes when there is emotional contact. You must strive for emotional contact with the customer. Emotional contact in turn creates trust and confidence. ACTION is visual and creates instant emotional contact. USE IT. All of these functions come under the generic title of Performance Management. A model of the process is shown below. Compensation : Determining fixed or performance-based pay. Succession Planning : Identifying candidates to replace incumbents in other, usually higher, jobs. Discipline : Undertaking probation or dismissal actions. Development: Training, job assignments, or mentoring relationships that increase employee competencies. Career Pathing : Planning for future job assignments designed to give employees specific experiences and/or other competencies. arena, organisations “migrated” to competency-based measurement totally believing that the qualitative or process approach used in defining the behaviors that should be used to define; excellence in performance was all that was necessary. However, those organisations that moved that way discovered that basing an appraisal entirely on competency measurement is not the answer, as there are too many other factors that impact on success. The literature and the Internet HR chat forums are full of stories from HR professionals that expose the weaknesses of using competencies as the sole measurement of a person’s performance. What has emerged is the concept of “mixed models” for appraisal. The mixed models focus on performance – the what of behaviour – the quantitative monetary, productivity, or quality results achieved in the recent past (annually), and on the qualitative aspects which are the competencies that need to be used in order to get the outcomes. Mixed models assess and reward both performance and competence, both what employees actually “delivered to the bottom line” in the past year and how they did it. 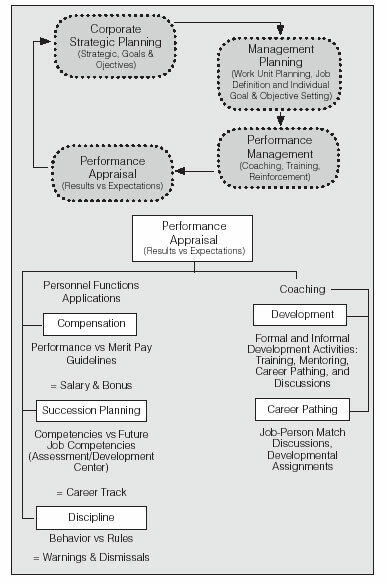 The figure shows how performance and competence are balanced in mixed models. In a line job, achievement of performance results may be weighted 90% and demonstration of competencies only 10%. At the other end of the continuum, a service position might warrant competence at 100%. Each position must be looked at differently according to the importance of either factor. Getting the most from your staff requires first class training sessions. Getting the most out of trainers and learning facilitators requires first rate programme preparation and materials. Article below explains how multimedia training can be an important part of any organisation’s training mix. Learning can be defined as the act, process or experience of gaining knowledge or skills. It is a basic, instinctive and adaptive function of people. More than any other species, humans are exible and active in obtaining knowledge and skills. So how can organisations direct the individual natural learning capabilities of their staff with the aim, purpose and objective of increasing their organisational productivity and results? Focusing on how adults learn is a good place to start. In a nutshell, the principles of adult learning also tell us that whatever we require which is relevant makes us open to information. Combined with existing knowledge and experience, we arrive at conclusions and understanding, which we then apply and test for confirmation. These principles correlate with the cognitive theory of multimedia learning, which states that the effective design of visual material should be based on the process of how learning occurs. Why use Multimedia Resources in Learning Initiatives? Multimedia resources are available in a range of delivery mediums including Video, VCD, DVD and CD Rom. They convey learning messages through full motion picture, text, graphics, still pictures and audio. These resources are also accompanied by expertly written support materials such as Course Leaders or Facilitators Guides and Participants Workbook. Training films incorporate all the rudiments of the adult-based learning principles- engagement of the learner from the outset with positive role or behaviour modelling reinforcement using correct way / incorrect way dramatised scenarios, enhancement of soft skills learning, realistic workplace examples and reinforcement. Most trainers prefer training films as an instructional communication media because they provide levels of consistency not possible with ther training tools. Film can be used repeatedly and to different groups within a team or an organisation. Having access to training films can also save valuable course preparation time and reduce training costs. With learning and development programmes leaning more and more towards an experiential rather than a traditional lecture-style approach, training films are becoming more integral to them. World renowned management gurus and inspirational sports heroes are amongst the experts who share their expertise and ‘secrets’ so that the rest of us may benefit from their wisdom and insight. This is powerful and motivational stuff! Various surveys have indicated the difference in our individual learning styles and how we learn via our senses. A huge 73% of our learning is said to be through what we see. The joint study by 3M and Wharton Business School shows that the assimilation rate and retention of information is vastly improved when a combination of different senses are engaged. The study reveals that we retain 10% of what we read, 20% of what we hear and 30% of what we see, but a whopping 70% of what we see and hear! Neuro-Linguistic Programming (NLP) theory shows that thinking is a mixture of internal pictures (visual representation system), internal sounds (auditory representation) and internal feelings (kinaesthetic representation system). Training films engage our visual and auditory senses, which in turn trigger our ‘emotive side’ or emotions, which leads us to interpret and ‘connect’. Hence fi lm is an excellent medium to connect with all types of learners. What are the Application Values of using Multimedia to Learn and Train? Interest, concentration, involvement and interaction levels are all increased. Accessibility and Choice – an extensive range of subject areas / topics. These are only some of the listed immediate benefits when organisations learn how to harness the power of using learning tools for training multimedia. Too many times I get frustrated with management that draft, redraft, readjust, recheck, redefine, realign and rework their Vision, Mission and Corporate Value statements over and over. Its amazing to see that each time they do this ‘mega review’, executives are full of confidence and excitement that this so called ‘final revision’ is the key to where their organisation is heading or what they are all about. With due respect… yeah right! It will probably last until the next CEO takes over. The problem lies predominantly in the belief that many management hold today as a corporate mantra. That belief is that “a well defined goal or direction is the key to the organisation’s success”. My question is: “How do you know?” Now, this is my personal opinion that you might want to agree or disagree with; and that is 'Vision, Mission or Values in many cases has been a waste of precious company time and money'. Well, it is a pretty bold statement for a Malaysian consultant. I have many friends who are CEOs, senior managers and executives who would probably ‘kill’ me for saying something like this. The key words here to notice in that statement are 'in many cases' and 'has been'. The reason behind such a ‘mean’ statement is because I feel in many occasions, management spent hundreds of hours meeting, debating and deliberating over the right words. Not to mention the tens of thousands spent on management retreat for the purpose of calming the mind, rejuvenating the body and elevating the soul so that top management would achieve ‘enlightenment’ to have the foresight of the company’s future. Of course, how could we forget the tens of thousands if not the hundreds of thousands that is spent on some consultants, depending if they are local or foreigner. Now all this is fi ne. I am not against any of these initiatives (especially the ones involving consultants). But my sincere thought is that after so much is done on these initial steps; they spend nowhere near enough time to align the business processes and the leadership styles within the organisations to reflect the values and the vision. Leadership Style and Business Processes are the two key components in turning a vision into reality. A well crafted vision statement is like a building’s blueprint. Without a project manager and the right building material a blue print is as good as it is on paper. The word here is Alignment. Alignment of leadership and business processes that reflect the corporate values. The primary focus of time and energy should be in the ‘process of alignment’ rather than process of crafting the perfect statement. I am not saying that taking time to think of the core values and purpose of our business is a waste of time. It is good that management has taken time and initiative to even think of where the business is heading. “Who are we?” “What business are we in?” “What core values should we live by?” It is a noble idea and takes guts to pen down the organisation’s course. However if the initiative stops there, then the effort becomes useless. Therefore when I said ‘waste of precious company time’, it is because that is how far many organisations take their value statements. There is hardly any significant emphasis to live the values on a daily basis. Process of alignment refers to how we are going to conduct ourselves on a daily basis. Things we are doing now that violates our Vision, Mission and Core Values – Stop It! Things we are doing now that is inline with our Vision, Mission and Core Values – Continue It! Things inline with our Vision, Mission and Core Values that are not being done now – Start It! For an organisation to live by their corporate values, it heavily lies on the alignment of the Leadership Style in the organisation and the alignment of the Business Processes or systems within the organisation. These two components carry significant weight to make an organisation walk the talk. But before we could drive towards the desired destination, we need to first release the hand-brakes. Misalignments are the handbrakes. Driving an organisation full of misalignment would be a real drag. Imagine a hundred metre runner running with a haversack. The sick, sad and amusing part is that many companies run their operations this way. Top management expects their people to ‘magically’ emulate a culture that only exist on paper but in reality almost impossible to achieve in the organisation. For as long as the alignment process is not being addressed from the angle of Leadership Style and Business Process, the environment does not make it conducive to grow the intended culture. Misalignment in leadership style occurs when the behaviour or conduct of the leaders in leading and managing the team does not reflect the corporate values. Another way is when the leaders’ default behaviour prevents the subordinates from embracing the corporate values. For example, the corporate value may suggest; “We practice legal and ethical conduct in all of our business practices.” However, he manager knowingly sanctions a purchase of some laptops for company use that was way below market price because they were smuggled goods. How will the subordinate ever respect a leader who cannot walk the talk? This is how corporate values become a corporate ‘joke’. What are some of the leadership behaviours that are inconsistent with our values? What are the practices that we do on a daily basis that violate our values? The best way to identify simple misalignments in a company is by looking around the organisation and talking to the people. I recommend forming an ad-hoc team by randomly selecting a reasonable number of individuals (not more than 30) from various disciplines within the organisation. Sort these individuals into groupsof five to six and ask each group to answer the two questions above for each core value. Then consolidate these misalignments. Chances are, you will find each group has identified similar misalignments. Find for misalignments that repeat in different groups. This will allow us to identify the top four or five most significant misalignments pertaining to each core value. What is business writing style? The communication style of any country is influenced by culture, history and societal standards. If we untangle some of the weaknesses of business writing style in Malaysia we can spot the influencing factors. Let’s see where these come from. First, we have the archaic leftovers from colonial times: “your good self”, “perusal”, “below mentioned”. These expressions from the distant past remind us how formal and stiff writing style tended to be in the late 19th and early 20th century. Then, we have the legalese such as “herewith”, “forthwith” and other incomprehensible gems. What do they mean? Mix in some business clichés from the late 20th century such as “value added” and “state of the art”. Add a bit of jargon and some SMS abbreviations (btw, tkx). Finally, there is an interesting collection of closing lines. These consist of fragments: “For your information”, “For your necessary action”, with a “please” tagged on just in case they do not sound polite enough! the world, including the UK. Readers are forced to re-read repeatedly just to understand the writer’s point. They are left wondering what action they are meant to take and end up putting the letter or email in the “I’ll deal with it later” file. In “olden times”, to be polite you had to use very formal language. Times have changed! Nevertheless, some managers expect their staff to write like this because “it’s the way we’ve always done it”. Is this a convincing reason? Writing style is like fashion. It changes. We do not wear the same clothes today that they wore in Charles Dickens’ time. So, why should we have to dress our writing in old-fashioned terms? A more competitive marketplace means we must do everything possible to keep the customers we have and attract more of them. Good writing will help us achieve this. Modern style means using short words, being straightforward yet polite, and communicating in a customer-focussed, conversational style. Free trade agreements, globalisation, the evolution of English as the language of business – these are all factors that have led to the emergence of what is called “International English”. We are communicating with people who do not speak English as their first language. Consequently, clear, concise writing that gets straight to the point is today’s norm. Look at any eCommerce website – do you see words like “herewith” on Amazon.com? What are the benefits to YOU if you change? All business communication is an attempt to infl uence your reader. You may want to get your leave approved or to convince someone to buy your products. If you write simply, politely and persuasively your reader will understand your message and give you what you want. You will create a better impression of your company and yourself. What are the benefits to YOUR READER if you change? They will know what they have to do and not be confused. They will think you are being honest with them and they will be willing to continue the relationship. They will understand your message on the fi rst reading and be a happier customer. Happier customers give you more business. Write short words, short sentences, and short paragraphs. Average sentence length is 12 - 17 words . Emails should definitely not need more than one screen; keep letters to one page. Clichés are overused expressions that have no impact because we are so familiar with them, for example - “We apologise for the inconvenience caused”. Instead, you could write, “We are sorry that we have to shut the server down for an hour”. This is more personal, more original and makes you sound more sincere. Tell your reader exactly what they have to do or what you are going to do for them. “For your necessary action” is vague and leaves the reader wondering what to do next. If you write, “Please sign the form and send it back to me by Friday 14 May”, it is clear to your reader what they have to do and by when. Put the main point or purpose of your correspondence at the beginning. This way, the reader knows why you are writing. Buy a good grammar book available from all big bookstores, and read it! If you put these best practices into effect, you will see immediate results. You will save time, your writing will be clearer and you will feel more confi dent in your writing skills. You don’t need big words to influence people – just clarity and sincerity. Years ago, Japanese manufacturers were threatened with higher quality products that often cost less. The response was the Quality Revolution. US manufacturers embraced Quality Circles, TQM and other methods, or they did not survive. Now, the world is more interconnected and complex. Globalisation is well and truly upon us and moving at ‘fast-forward’ speed. Contracts are going to countries like China and India, who can make things faster and cheaper. We can no longer compete on price as someone else can always make it cheaper. Even Katsuhiko Mashida, president of Japanese company Sharp Corporation, is quoted as saying, “Survival today means innovating and doing things that no one else does. This is a lesson not only for Sharp but for all of Japan.” It is indeed revealing for such words to come from a voice within corporate Japan, where companies typically prefer to run with the pack. But the business world in Japan has come to realise, after a decade of stagnant economic growth, that the only way to survive is to change, to innovate, and to take risks because there is no other choice. Innovation rarely happens by accident. It requires concentrated focus on problems and challenges, and a fresh look at creating solutions to go beyond existing answers. If you assume innovation is merely a synonym for new products, think again. What about strategy innovation, such as entering new markets with your existing products? What about supply chain innovations? What about value- adding service enhancements that allow real time responsiveness, make the customer’s life easier, and otherwise tackle the customer’s problem in ways competitors are unable or unwilling to do? Such strategy innovations are a bold new frontier many companies have never pursued. Your skilled workforce is your competitive advantage – but only if you see it and engage people creatively. Of course, you already need to produce more with fewer people. Yet few companies tap the mega-asset of people power. They do not engage their staff to be thinkers. Companies need to move their staff from being complacent and a change resistor to someone who is innovative and a risk-taker. However, before companies can begin tapping into this rich source of innovators, the workplace environment needs to become a permissive or conducive innovation environment. Nothing could be worse than when someone in the company is put down or humiliated for a suggestion or idea that he has given. The company must ensure that the structure is in place, a structure whereby the employees are encouraged and recognised for the innovation ideas that they may recommend to the company. It is often heard that in order to be innovative, we must start thinking ‘outside the box.’ What if we want to start thinking outside the box, how would we go about it? We cannot expect our staff to start thinking innovatively by simply switching on an imaginary switch in their mind. They need to be provided with innovation tools which would unlock and enhance their innovation skills, generating ideas to optimise the effectiveness and efficiency of their jobs and their business. With the right tools, employees can begin thinking innovatively at any time, working alone or in groups to tackle simple or complex problems. Focus Learning Corporation Sdn. Bhd. has designed a programme called the ‘Seven Innovation Tools’ which would provide companies to develop an innovative workforce towards achieving business excellence. The programme looks at techniques to create a permissive innovation environment and provides a set of tools to assist the participant develop the necessary skills to facilitate the innovative thinking process. Most sales super achievers are excellent in convincing customers because of their boundless excitement, their charisma and their total belief in the product, which is contagious, but not necessarily because of their understanding of selling skills. They are good, but they may not know why. Of course, that is not important as long as they maintain their excitement and faith in the product. But sooner or later, the need for that quiet confidence of being a sales professional whose strength is in the understanding of selling skills will surely emerge. The moment they understand the fundamentals of selling skills, they will not only increase sales but also stay longer and maintain a consistency in production too. As for average performing sales personnel, mastery of the fundamentals of selling skills and then applying them to their job will help them with a consistent income. One of the harsh realities of the selling profession is the high turnover of sales personnel. This is because new sales people don’t usually earn a certain level of income consistently to meet the budgetary demands of present day living. If it’s not worth their while staying with the company, hey move on. Some companies have the attitude that training their sales personnel on selling skills is a waste of time and company funds. After all, they say, in the end the salesperson will still quit anyway, and perhaps join the competition. These companies usually find themselves caught up in an unpalatable situation, a vicious cycle -- business is bad because of a lack of sales personnel; existing sales personnel quit as fast as they join, because they don’t earn enough for their survival; these sales people don’t earn enough because they are not trained on the basics; they are not trained because the company is worried that such training may eventually benefit competition. Back to square one. A vicious cycle. The moment salespersons understand selling skills, they become consistent producers, which means a steady income, which means there is sufficient motivation to stay on. Training therefore is an effective wedge against high staff turnovers. An individual remains loyal to a company if he / she realises that the company is interested in helping him / her become a professional on the job. Professionalism means more than just giving better sounding designations; it means that the person has mastered the craft, in our case the craft of professional selling. Sales managers are supposed to train their sales personnel on fundamentals selling skills. In theory, at least. In reality, the sales manager finds that a major portion of his / her time -- even with excellent time management -- is spent on paperwork and administrative duties, ensuring that quotas are met, planning / organising promotions, and imparting product knowledge and policy information. Very rarely are managers well versed in the many-faceted art and science of training; they should delegate the job of training to a training professional (who, preferably, should have been seasoned sales person as well). Offering training to sales personnel ensures that the company maintains a competitive edge in the market place. Traditionally, training is perceived by employees as a fringe benefit. Serendipity sets in when a company invests in sales training for its sales personnel. Trained staff enthusiastically advertise to the world the fact that they are happy with the company; the resultant publicity brings goodwill and enhances the image of the company -- as well as ensures a steady stream of hopeful job applicants, a situation which will afford the company the luxury of being able to choose quality employees. Finally, a professionally trained sales force optimises the ultimate reason for a company to be in existence -- creating wealth by serving and keeping satisfied customers who come back for more. Employers when debating whether a training course is necessary for their employees will most probably consider only the cost of the training project. If the cost of training is too high, the organisation may not want to go through with the training course because they could not quantify the effectiveness or the benefit of the course and use it to compare with the cost of the training. Most decision-makers could only look at the cost and question the cost-effectiveness of the training. They would find it easier to measure the costs of conducting training than to quantify the outcomes of the training. However, one can look at the potential savings that could be generated from the training. This realistic savings can then be matched against the actual costs of the training. By doing so, decision-makers will find a reasonable training that could be targeted to measurable business results. Try to quantify this level of performance into monetary value before training. For example: 10 rejects per month x time taken for correction x RM20 (of salary) per hour= RM100 per month. Then, you need to identify the possible change that training the employee can produce. For example the employee has fewer errors. Perhaps from 10 rejects per month to 6 per month. Using this knowledge, calculate the possible savings. That is 10 – 6 = 4 reduced errors = 4 x time taken for correction x RM20 = RM40 per month of possible savings. Firstly the company must know the goals or original reason that the training was conducted e.g. the purpose of the training is to reduce production cost or to increase the sale of repeat business. If the staff obtained the maximum result from the training, there could be savings in various aspects. There could be fewer errors from the staff which means less equipment downtime and faster equipment startup time. When the employee is more effective and able to increase revenue collection, these are the benefi ts. There could also be reduced customer turnover due to the employees’ enhanced effectiveness in attending to the products (or customers in service environment). Through proper training, the employees could also be motivated to prepare good new customer strategies which could bring in more new customers. In turn, this could lead to increased revenue for the employers. When the employees can handle their job better, this could mean fewer grievances from the workers and thus less work stoppage. Proper supervision and happy employees mean reduced employee turnover. This would lead to less recruitment costs because employees are not leaving and thus the recruitment exercises of new employees are reduced. There is also the possibility of employees being able to take on higher positions due to the training and only the lower positions need to be recruited. This would also mean a reduced recruitment cost. After you have obtained the potential savings that would be generated by the training, then you can calculate how effective your training is by comparing the costs of the training against the benefits that would be obtained. The method is to compare cost per participant against the potential savings (as a result of the training) of one participant. When preparing your case for application for training for your staff, you need to multiply the cost per participant by the total number of participants. Do the same for the potential savings. With the total costs of the training and the possible savings obtained by the training, then you have a better stand for presenting your reason for training for your staff.